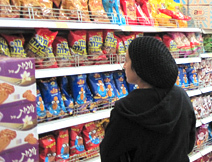 Colel Chabad, in partnership with the Joint Distribution Committee, has been designated by the Israeli Government to take charge of eliminating hunger among Israel's neediest. This nationwide undertaking is now in its third year, with 48 municipalities already included. The program provides for the chronically dysfunctional, while empowering others to take control of their lives and achieve nutritional independence. 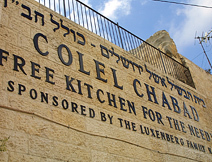 Since its founding in 1788 Colel Chabad has always placed nutrition at the top of its priorities. 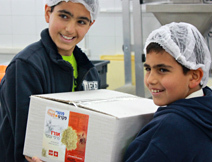 Today Colel Chabad operates a myriad of programs to make sure Israel's neediest don't go hungry. These range from our proprietary network of 22 free soup kitchens, to home delivery of hot meals to homebound seniors, to monthly food crates that provide for an entire family, to low cost supermarkets where the poor can shop while saving 40% on their purchases, to holiday food deliveries for the near poor. 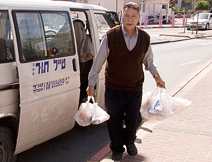 There is still much to be done in order to achieve total food security for all of Israel's poor and near poor citizens. In the coming years Colel Chabad plans to open additional subsidized supermarkets in poor neighborhoods, build additional soup kitchens for senior citizens and dysfunctional people, expand its distribution of monthly groceries to reach more needy families, and to expand its holiday food distribution program.